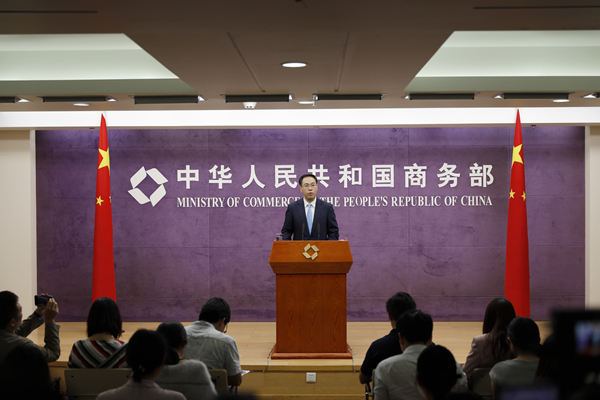 China has received an invitation from the United States to hold trade negotiations, said a spokesperson of the Ministry of Commerce (MOC) Thursday. The confirmation was made by MOC spokesperson Gao Feng at a press conference held in Beijing, saying that China welcomes the attitude and the two countries are in discussion about the details. "Recently, the negotiation teams of the two sides have maintained contact in various forms and had exchanges on each other's concerns," Gao said, stressing that China believes an escalation of the trade conflict goes against everyone's interests. Responding to possible U.S. additional levies on all Chinese imports, Gao said the U.S. unilateral tariff hikes will ultimately harm the interests of the people of China, the United States, and the whole world. The United States has ignored opposition from the vast number of industry representatives and consumers and continued to release news that may lead to an escalation of trade frictions, Gao said. "This practice of blackmail and pressure does not work on China and will not help solve the problem," Gao said. China hopes the United States will follow the people's will and adopt pragmatic measures to bring China-U.S. economic and trade relations back to normal through equal and honest dialogue and consultation, Gao said. When answering a question about the U.S. threat to punish Chinese companies using the excuse of intellectual property theft, Gao said China hopes the United States can treat the business activities of Chinese companies objectively and fairly. "We hope the United States won't chase the wind and clutch at shadows, and does not seek excuses for its trade protectionism, so as to avoid making global companies, including Chinese ones, lose confidence in the business environment of the United States," Gao said.